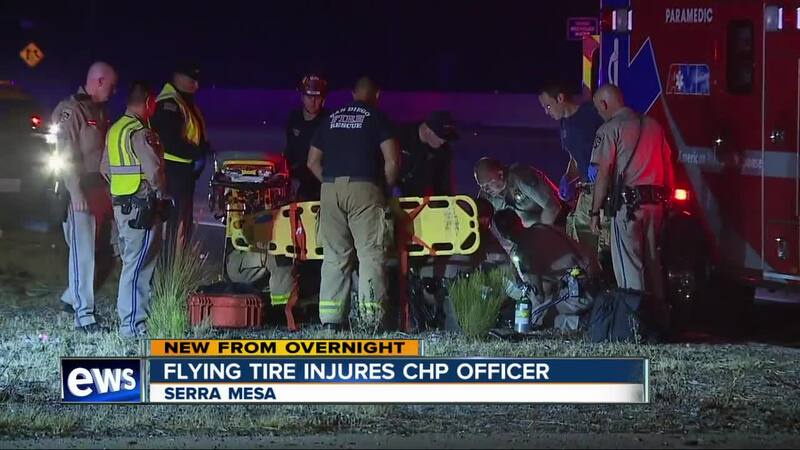 SAN DIEGO (KGTV) - A California Highway Patrol officer was injured Thursday after being struck by a tire as he tried to help clear a crash on Interstate 15 in the Serra Mesa area. The incident happened at around 1:45 a.m. on southbound I-15 near Friars Road, CHP officials said. Several officers were at the scene of a two-vehicle crash on the shoulder when a wheel came off of a passing car and hit an officer. The officer, who was struck in the leg, was conscious and talking to emergency responders before he was rushed to the hospital. He is expected to be OK, but CHP officials confirmed he suffered a "serious injury." The officer is a 15-year CHP veteran who has been on the San Diego force for the past three years. The driver of the car that lost the wheel told 10News he had no idea the tire hit someone. “I was driving down the road and then I start hearing this clicking noise, and then all of a sudden the wheel pops off. I start seeing sparks everywhere and I pull over on the side of the road,” the driver said. Investigators believe the tire fell off the car because it was missing a hubcap and three bolts.